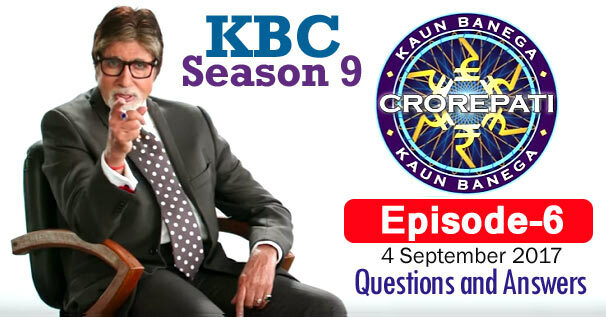 KBC Season 9 Episode 6 Questions and Answers: The sixth episode of Season 9 of Kaun Banega Crorepati (KBC) was telecast on 4th September 2017. In which Amitabh Bachchan had asked contestants 16 questions of General Knowledge. The correct answer to all the questions is given below each question. By reading these questions, you can prepare yourself for the next KBC Season 10 of Kaun Banega Crorepati. Because by reading these questions, you will understand what kind of questions asks Amitabh Bachchan in KBC. These all general knowledge questions will be helpful to for you various Competitive Examinations and Interviews besides KBC. Remember, the answer to some question may be in accordance with that time, while the answer to those question may differ according to the present time. 1. Arrange these states in increasing order of the area they occupy from the smallest to the largest? 2. Which of these blessings wishes victory to someone? 3. Which of these is a major Kharif crop ? 4. What is the name of the toilet usage campaign started by the Government of India ? 5. Jharkhand was formed on 15 November 2000 on the birth anniversary of which tribal leader ? 6. Which of the following is capable of surviving without its head for a weak or longer ? 7. Sinhasan khali karo ki janta aati hai are the lines of a poem written by which poet ? 8. According to Mahabharata, Bhishma, Karna and Dronacharya were all disciples of which of these gurus? 9. Which of the following is capable of surviving without its head for a week or longer ? 10. In a famous doha 'Dukh me sumiran sab kare, sukh me kare na koi', what does 'Sumiran' mean ? 11. Which leader's voice is this ? 12. Which 2007 Hindi film shares it's title with a popular song from the 1968 film 'Padosan' ? 13. Who became the first Indian to win the men's singles Australian Open Super Series title in 2017 ? 14. Which of the following leader of India's struggle for Independence wrote the book 'India Divided' ? 15. Which of these Supreme Court judges has also served in the International Court of Justice?